Star Wars: Starfighter is an action game, developed and published by LucasArts on February 20, 2001. It is often characterized as a flight simulator or space simulator for its emphasis on flying. 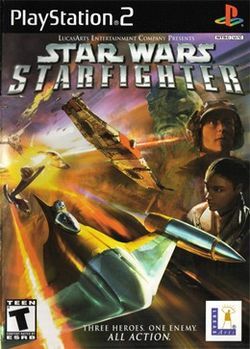 Ten months after the initial release on PlayStation 2, an Xbox version was released under the title Star Wars: Starfighter: Special Edition with enhanced graphics, improved multiplayer and several other upgrades. The Xbox and PC ports were performed by Secret Level. During Q3 2003, Tsunami Visual Technologies released the title on their TsuMo motion-base arcade platform. The original release became unplayable on contemporary PCs about two years after its release, as newer versions of Microsoft software caused the game to run extremely slow. LucasArts re-released the game with a fixed engine on the Steam content distribution platform on July 8, 2009. A sequel was released in 2002, named Star Wars: Jedi Starfighter. The game's setting takes place right before the Battle of Naboo. The player unites alongside three starfighter pilots and is allowed to take control of several different spacecraft to help stop the invasion that threatens Naboo. This page was last edited on 16 August 2016, at 18:04.